It's been a long time coming, but structural reforms to the regulatory process are finally starting to reach the mainstream. Presidential candidates, and sitting members of Congress alike, are increasingly proposing ideas and legislation that would change the way regulatory agencies go about making regulations, rather than reacting to each individual regulation as it is produced (although, to be sure, that still happens, too). And it's for good reason that more and more people want to change the regulatory process. In years past, it may have been easy for politicians to delegate responsibility to agencies and then act as if the issue had been solved. But the delegate-and-forget-about-it doctrine led to a fourth branch of government — the regulatory agencies — producing far more law than Congress itself, and accumulating a stockpile of regulations that is so large that it would require nearly three years for a person to read through the current federal regulatory code. The legal authority for regulation comes originally from Congress. But agencies often receive broad or even vague mandates in legislation, and Supreme Court precedents (e.g.,Chevron U.S.A. v. Natural Resources Defense Council, which led to "Chevron deference") give the agencies wide latitude in interpretation. As a result, even relatively concise congressional legislation can grow over time. And grow they do. For our RegData project, we counted the number of individual restrictions — words and phrases that indicate a specific prohibited or mandatory activity — contained in the Code of Federal Regulations (CFR). In the 2014 CFR, we found about 1.1 million restrictions, each one every bit as legally binding as a law passed by Congress and signed by the president. According to the 2016 Regulator's Budget by Susan Dudley and Melinda Warren, taxpayers spent about $62 billion on the production and enforcement of regulations, although that figure excludes a number of significant regulators for technical reasons — and both the budget and number of restrictions have grown consistently over the time they have been measured. Over the last 20 years, the regulatory budget has more than doubled in real terms, while the number of total restrictions has grown by about 220,000 — a 25 percent increase. The agencies with the highest regulatory output, as measured by regulatory restrictions printed in federal regulatory code, are familiar: the Environmental Protection Agency (EPA), the IRS, the Coast Guard, the Occupational Safety and Health Administration (OSHA) and the Federal Communications Commission (FCC). Between them, these five agencies account for more than 314,000 restrictions, nearly a third of the overall total. The EPA, however, stands out even from that crowd. The EPA alone is responsible for about 14 percent of all federal regulatory restrictions. In fact, at more than 150,000 restrictions, the EPA more than doubles the next largest agency, the IRS, at about 58,000. This preeminence is particularly noteworthy because it was only created in 1973; many other significant regulators were born out of the New Deal, giving them a four-decade head start. But the growth of EPA restrictions has been unmatched. The EPA accounts for nearly 80,000 of the overall 220,000-restriction increase witnessed over the past 20 years. In its 20 years of existence, the EPA added more restrictions than any other agency has written over its entire existence, despite being much younger than many other agencies. Should we expect to see differences in statistical measures of regulation when Republicans hold the White House versus when Democrats do? After all, regulatory agencies are (mostly) housed in the executive branch and are ostensibly controlled by the president. We prefer to let the data answer that question. Year after year, the body of regulatory law has grown steadily, without regard to which party held Congress or the White House, as the nearby figure shows. 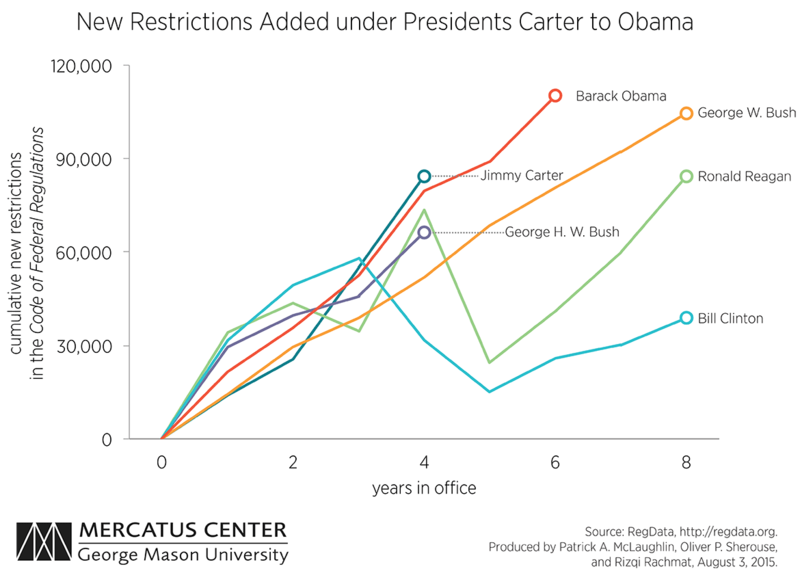 Regulation has grown under every president for which we have data, and at nearly the same rate — with the exceptions of Reagan's second term and Clinton's second term. It seems that once lawmaking authority is delegated to regulatory agencies, they act like perpetual motion machines (well, except that the fuel for their motion comes in the form of outlays appropriated by Congress). This fact may be driving the desire for meaningful reform to the process, since it seems that controlling the White House is not sufficient to alter the path of regulatory accumulation.